Safety and crash behaviour of systems is an important and increasing area of focus in the automotive industry. We have successfully been making the roads safer for more than half a century. Our products has propelled us to to the forefront of our business. To develop products with improved crash behavior and reduce risk in transportation, we have implemented a crash test track at Klippan Safety. The track allows us to test all typical crash pulses used in vehicle systems today with any acceleration up to and well above 50g. The track is complemented by experienced crash engineers with extensive knowledge of crash simulations. Klippan Safety carries out both static and dynamic tests to ensure that legal and customer specific requirements are being exceeded. 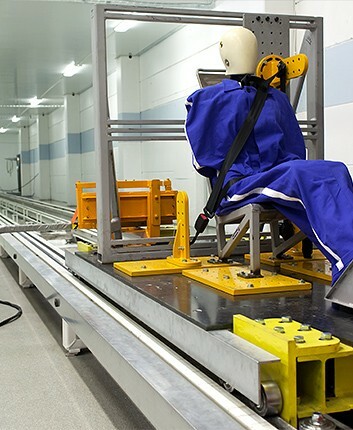 The crash test track at Klippan Safety is based on a sled with universal mounting possibilities accelerated by a set of elastic bands. The sled is decelerated by plastic deformation of steel bars, which allows a precise control of the crash pulse. The initial speed at impact and the deceleration profile can be customized for every load and crash case, to generate a precise and accurate crash pulse. The Klippan Safety center of competence for safety technology is active in internal development projects, but also as an external provider of tests and technologies for organizations outside of the Klippan Group.